This version of a Pork Larb is reasonably quick and simple to make but it does involve some pre work in terms of chopping etc. If you are wondering why I haven't included quantities of the spices/seasonings, it's not just because I don't measure them out, it is because everyone's palate is a little different. What I am looking for in this dish is a balance between sour, sweet, salty and heat (chili). Just add a little of each at a time until it feels right when you taste it. A cup of lettuce to serve the larb in - I mean a whole lettuce leaf from the outside of a head of lettuce that curls round to form a neat little container for the larb. To cook it just fry the pork mince in the oil until a bit brown. Then add your onion and seasonings. Continue to fry until cooked (no more than 10 minutes) Add your broth and remaining ingredients, heat through and serve with your nut garnish and lemon wedge in a lettuce cup. You could serve rice on the side but I often don't. That looks so good! Serving in lettuce cups is perfect for summer. I often make a ground beef version of this to serve over rice for a quick dinner. Lettuce wraps! So refreshing for the summer. A nice change. Thanks. I make something similar except I use coriander and peanuts. I also sometimes mix it up by using turkey mince as it's lower in fat. 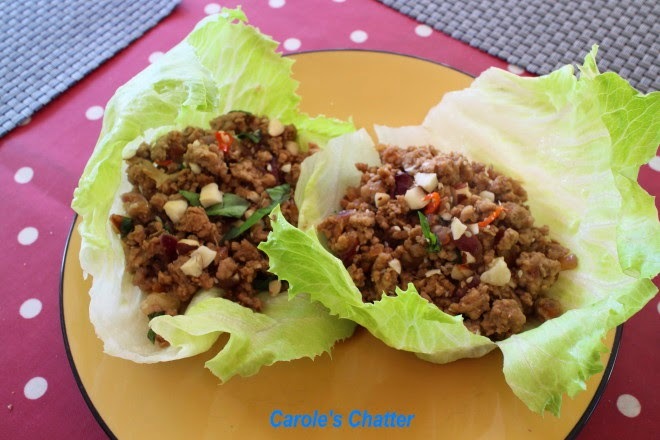 That sounds great, and lettuce wraps such a good idea for those of us trying to eat less carbs - I find it surprisingly satisfying. So pretty on the plate! I've never heard of Kecap Manis (but it sure sounds good). Can you find it in regular grocery stores or do you buy from specialty shops? I'm always up for new seasonings. Looks delicious, Carole. Larb is one of those dishes I love and keep meaning to have a go at making, but somehow I've never gotten around to it. I'm bookmarking this one to try. Great idea for a light summer meal...and for my husband who like to eat low carb. Thanks for sharing, Carole.